But while in death he is provoking grief in those who were close to him, in life Rob Ford was the direct cause of a lot of pain and suffering in his role as a public official. And it is unacceptable that we allow the pain of Ford’s family to eclipse the pain of Ford’s victims as we recount his legacy and assess his life. Of course, there is some overlap between the two categories. Nowhere in the popular obituaries I’ve seen circulating on social media today has there been any acknowledgement of the persistent indications of ongoing domestic abuse, nor of the 2008 charges (ultimately dismissed) laid against Ford for assaulting and uttering death threats to his wife. CBC relegated to the second-to-last paragraph of its obituary any mention of the sensational accusation, levelled by former Ford chief of staff Mark Towhey, that the former mayor once said he’d like to put three bullets into his wife’s head. That these allegations, which were in common currency long before the crack scandal erupted, were not themselves sufficiently scandalous to trigger calls for the mayor’s resignation is a sad commentary on the status of women in Toronto. 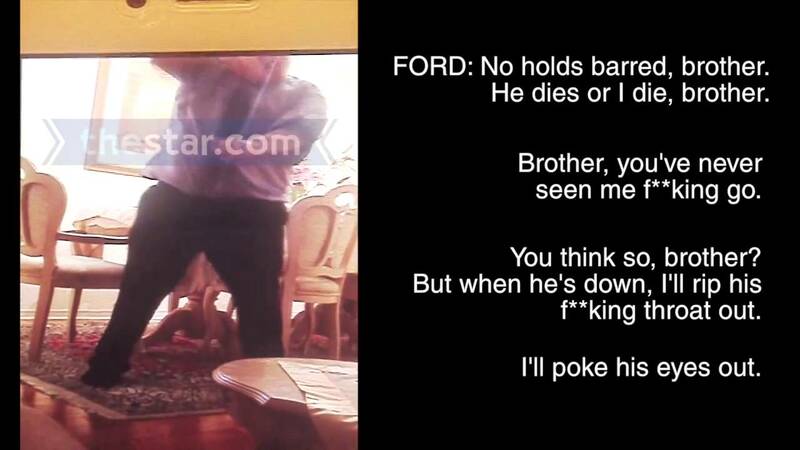 Ford was also videotaped threatening to kill somebody, allegedly his sister’s ex-partner, Scott McIntyre. McIntyre alleges that Ford, while mayor, set him up for an arrest and then orchestrated a vicious beating in prison after McIntyre demanded money from Ford. And Ford was at one point in his mayoralty forced to deny that he had any role in the murder of Anthony Smith, whose death, according to two senior officials in the Ford administration, was connected in some way to an extortion plot to retrieve the crack tape that nearly brought down Ford’s mayoralty. Smith was pictured next to Ford in the infamous photo which accompanied the initial reports of the video. Ford advisor David Price told police that Smith was the owner of the video, and that his murder, which occurred several weeks before the Toronto Star and Gawker were approached with the story, was motivated by a desire to obtain the footage. Ford’s role in the unsuccessful attempts to retrieve the crack video is unclear to this day; his close friend Sandro Lisi, with whom Ford was in constant communication during the period Lisi was attempting to get his hands on the recording, was eventually charged with extortion. This doesn’t even begin to cover the damage Ford did policy-wise as mayor. Though Ford, along with his brother Doug, regularly engaged in patronizing photo-ops/cash giveaways at TCHC properties, they were no friends to the poor. Cuts to funding for libraries, TTC service, and other municipal services had a major detrimental impact to the lives of Toronto’s low-income residents. His stubborn refusal to act on or even acknowledge a critical shortage of emergency shelter beds led directly to the deaths of several of Toronto’s homeless. His administration attempted to dismantle the Toronto Community Housing Corporation by firing the TCHC’s entire board, forcing his own appointee into control, and then selling off the commission’s most valuable properties. Under Ford’s tenure, wait lists for affordable housing and repair backlogs for TCHC’s properties continued to balloon, even as he pushed for cuts to funding for social housing. And then there was his blatant bigotry. In an audio recording, he could be heard disparaging Ontario Progressive Conservative Party leader Tim Hudak because Hudak had apparently decided to “agree with all the gays”, and in the infamous crack video, Ford apparently called Justin Trudeau a “fag”. Ford famously refused to attend Pride for the entirety of his tenure as mayor, using the rather feeble excuse that his family always spends that weekend at its cottage. Yes, Rob Ford often went out of his way to respond to his constituents’ concerns, and yes, he was uncommonly adept at playing the game of populism, and yes, he loved his football team, and yes, his family is deeply grieved by his death. But he was also an unrepentantly vile person. In his capacity as city councillor and then mayor, he worked tirelessly to make life worse for Toronto’s poorest and most vulnerable citizens. He was bigoted in his speech and in his actions. He was an abusive man, and persistent suspicions of his involvement in gang violence are incredibly troubling. He was a divisive and disastrous mayor, so inept that council stripped him of all but his most symbolic powers in the latter days of his tenure. The persistence of his popularity among the so-called “Ford Nation” does not excuse any of this, nor does his recent death. Any examination of Rob Ford’s life and legacy which fails to mention any of these defining traits of the man does a disservice to the public.